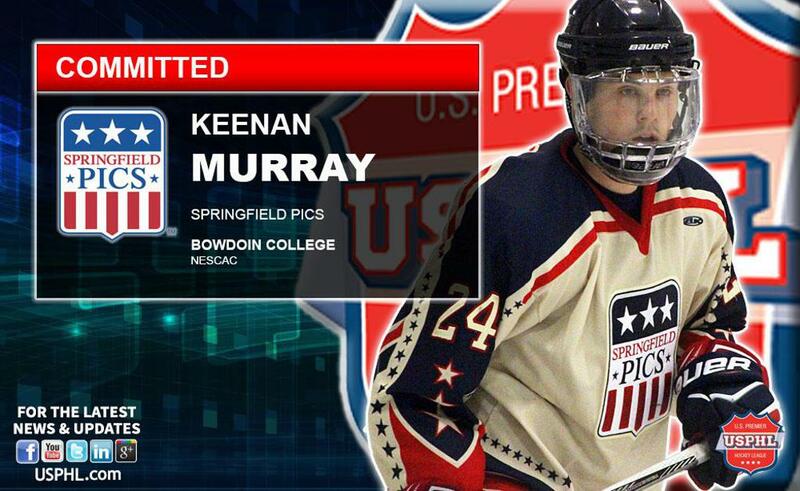 The Springfield Pics are proud to announce that defenseman Keenan Murray has committed to Bowdoin College for this fall. The Upper St. Clair, Pennsylvania native scored three goals and added 15 assists for 18 points in 33 games on the Pics’ blueline. “I’m really excited. I couldn’t have done it without the help of the coaches here. It helped that we had a great season here. I played in this league to play four more years and I have the opportunity to do that,” Murray said. The Polar Bears compete in the NESCAC, one of the premier NCAA Division III conferences. “I think the NESCAC is a really competitive brand of hockey. Bowdoin fit me on the ice and off and I’m really excited to get my career underway there,” Murray noted of his decision to join Bowdoin as a member of the Class of 2021. Murray will join Pics alumnus Spencer Antunez on the Polar Bears roster. “I’d like to congratulate Keenan and his family on this accomplishment. Any time you can combine outstanding athletic and academic achievements to reach an institute like Bowdoin, that’s really what this process is all about. Keenan came to us from Taft, and continually showed up to the arena every day looking to improve his game to ultimately reach this point. We wish him the best of luck at Bowdoin and expect him to be an impact player,” Pics head coach and general manager Patrick Tabb said.